(CNN) -- Tons of household chemicals that were once stored safely in garages, bathrooms and kitchen cabinets along the Gulf Coast pose a potential environmental threat after being scattered by Hurricane Katrina and its twin Rita. The storms destroyed or damaged some 160,000 homes and left an estimated 22 million tons of debris in their wake. That's enough to cover 200 football fields with a 50-foot pile. Buried in the mess, like toxic needles in a haystack, are paint cans, bottles of chlorine bleach, drain cleaners and other contaminates. WASHINGTON, Sept. 15 - The Environmental Protection Agency could suspend any law governing air, water or land in responding to Hurricane Katrina under a measure introduced Thursday by the chairman of the Senate environment committee. The legislation, which drew immediate criticism from environmental groups, would create a 120-day period in which the agency's administrator, Stephen L. Johnson, could waive or modify laws if it became "necessary to respond in a timely and effective manner" to a situation created by the storm. The proposal would allow changes in law at the discretion of the Bush administrator in consultation with the governor of "any affected state." EPA is carrying out extensive sampling of standing flood waters in the City of New Orleans. The Agency follows a quality assurance process that ensures that the data is thoroughly reviewed and validated. This process is being used for all data received as part of the emergency response. EPA is ensuring coordination of data between federal, state, and local agencies and will routinely release data as soon as it is available. 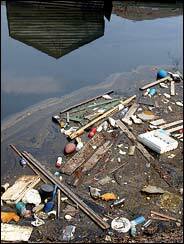 Visit the EPA Hurricane Katrina site for more Environmental Issues. New test results released by the federal Environmental Protection Agency Sunday evening confirm that toxic chemicals contained in floodwaters in New Orleans and Metairie are in concentrations too small to be an immediate threat to humans. But so much saltwater has entered the city that it could be very difficult to grow a lawn for a very long time, according to Wilma Subra, an independent chemist from New Iberia who often advises environmental groups. The federal agency collected water samples from six locations on the east bank of Orleans and Jefferson parishes on Sept. 3, five days after Hurricane Katrina decimated the area. As it reported last Wednesday, EPA found very high levels of lead in water sampled at the North Claiborne Avenue exit off Interstate 10 in New Orleans. The 846 parts per billion of lead far exceeds the agency’s 15 ppb standard for drinking water. NEW ORLEANS, Sept. 11 - You cannot drink it, you cannot bathe in it, you can barely stand the smell of it. No child stands ankle-deep in it with plastic bucket. No preacher wades into it to baptize a sin-sullied flock. What laps against this city's shores, and some of its homes, churches and stores, is not water but a kind of anti-water. Green-black more than blue-green, it evokes nothing of the cathartic promise that Bruce Springsteen often sings of, only destruction, disease and death. When not posing a threat, Lake Pontchartrain here has offered relief, joy, a point of reference. The Choctaw tribe called it Okwa-ta, meaning "wide water"; a French explorer named it after some marine minister back home. It has provided fish for food, waves for fun, backdrops for amusement parks. The earliest jazz wafted over its waters from lakefront resorts.